See and download the rules of Micro Monsters, a funny game for all family, challenging players in dexterity and strategy. This file includes the War of the Ring Second Edition Player Aid (Game Turn, Resolving a Battle, Activating Free Peoples Nations, Advancing a Political Position); the Action Dice Reference Chart; and a two-page Glossary of the essential game terms. Updated 04/11/2017. 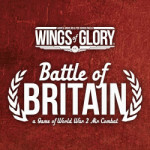 See and download the Basic, Standard and Advanced rules to play WW2 Wings of Glory game. This file also includes optional rules and a variety of different scenarios.